Sarah Badiyah Sakaan is a New York City based Syrian-American actress, playwright and theater maker. She is Associate Artistic Director of the Brooklyn based theater company Polybe + Seats, polybeandseats.org. Her latest play The Art of Hijab, Kohl Black and the Right Way to Pray will be produced by Polybe + Seats at Five Myles Gallery in January 2018. Also with Polybe + Seats, Sakaan has written, performed and produced her play Anna Asli Suriyah (I Come from Syria) as a one woman show from 2015-2017 and as an ensemble play in August 2014 at the site specific venue Beit Jeddo in Bay Ridge, Brooklyn. 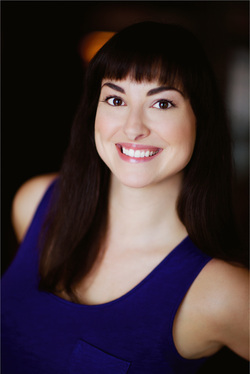 Sarah conceived of the play with Artistic Director Jessica Brater and served as the lead writer and actor on the project. Excerpts of Anna Asli Suriyah have also been presented at the University of New Haven, LPAC, and The World Refugee Crisis Forum (hosted by Amnesty International and Fort Green Peace). Sakaan has performed her One woman version of AAS as part of The Bad and Nasty Theater Festival and at The Lady Liberty Theater Festival in Manhattan. Sakaan's writing is influenced by her upbringing in Memphis,TN, in multi religious, multicultural household. She is interested in themes of social justice, social-cultural rituals and traditions, current events as well as assimilation versus cultural preservation. Her work centers around the development of new plays and collaboratively developed works in the independent theater of NYC and Brooklyn. Sakaan has lived and worked as an actor in Brooklyn, NY since 2005. She holds a B.F.A. in Acting from Emerson College. As Playwright in Residence at LaGuardia Performing Arts Center (LPAC) in 2014-2016, she wrote The Art of Hijab, Kohl Black and the Right Way to Pray, which had a March 2016 workshop performance at LPAC. Sakaan is the recipient of A.R.T/ NY’s Creative Space Grant and Brooklyn Arts Council Local Arts Fund and Brooklyn Arts Support to continue development of The Art of Hijab, Kohl Black and the Right Way to Pray 2017-18. With Polybe+Seats she has joyfully performed in Granada, A Thousand, Thousand Slimy Things, Alice or The Scottish Gravediggers, and A History of Launching Ships. For P+S she has also developed Dreamscape for the Figment Arts Festival and Project Syria, a solo performance from In the Atrium: Polybe + Seats in Progress at Brooklyn Winery. NYC acting credits include Yes is for a Very Young Man by Gertrude Stein at TMT, Gulnare in The Corsair, directed by Katie Naka, Columbia MFA Directing Thesis and Mae in Cat on a Hot Tin Roof directed by Katie Naka Columbia MFA Directing Thesis, Doctor Faustus with Queens Players, Jose Rivera's Sonnets for an Old Century with Impulse Initiative, King Lear as Earl of Kent with Balloon Heaven Productions and Sybil Kempson's KurbisGeistNacht at Dixon Place. Sarah has also worked with The Flea Theater as a member of The Bats, the resident acting company of The Flea. Projects at The Flea include Dawn, Offending The Audience and Post Mortem. Film credits include "Oh Boy! ", Shot at Sundown and Project NIM. Sarah is originally from Memphis, TN and holds a B.F.A. in Acting from Emerson College.